This article was originally written for Nos Ancetres Les Maulois, the journal of the Association Culturelle pour L'Information des Maulois, which published a condensed version a few years ago, in French (Quelques Membres Eminents Des Familles Maule Americaines, 30 Nos Ancetres Les Maulois 34 (1995)). This is its first public appearance in English. See the copyright notice at the bottom of this page. When Mme. Baxas asked me several years ago to write an article about prominent members of the American Maule family, I was honored to be given the opportunity to share Maule family history with the citizens of our ancestral town. I apologize that it has taken three years for this article to appear. The reason was NOT a shortage of prominent American Maules! It was simply that my professional and personal lives have been very busy. Writing this article has made me appreciate the difficulties and challenges faced by editors of biographical dictionaries, who must draw a somewhat arbitrary line between those to be included and those to be excluded. Many members of the American Maule family have accomplished much within their chosen fields, and have done much of which they can be proud. Not surprisingly, there are no infamous Maules in the family, and the proverbial horse thief has yet to surface! I would like to share the bases on which I chose the persons whose biographies follow. First, I limited my selections to Thomas Maule of Salem, Massachusetts, and his descendants, because the intensive research into that family has not been matched with respect to any of the other Maule families that have settled in America and so little, in comparison, is known about them. Second, I selected each individual who, to the best of my knowledge, has been the subject of an entry in a biographical dictionary, has been memorialized in a New York Times obituary, has written widely published books, has engaged in activities that brings him or her to the attention of a regional or national audience, has held or sought major public office, or has been the recipient of widely recognized prizes or awards. Many of the biographies are brief, because in some instances I have had access to only a limited amount of information. There surely must be other members of the family who would have been included had I known more about them. For every person who is described in one of the following biographies, there are dozens of family members who have been widely known within their local community, who have provided valuable community service, who have operated successful businesses, who have served with distinction in the military, who have raised fine families, and who have overcome much adversity to achieve their successes. I think, in no particular order, and with apologies to those not mentioned by name, of Edward Maule, who settled Beaver Crossing, Nebraska, while living with his family in a sod house, of Mary Anna Maule and Edith Zink, who taught in their respective communities for more than fifty years and earned the respect of so many students and other citizens, of the many members of the Mendenhall-Anderson branch of the family who served Cincinnati and its institutions so well for many years, of William Maule and his son Wynne M. Maule, who served as dedicated senior public servants in the United States Forest Service and Park Service, respectively, of George Stephenson Maule, who for many years owned and operated Maule Drug Store in Wichita, Kansas, and of the many other teachers, attorneys, household managers, executives, writers, mechanics, athletes, stock brokers, truck drivers, bankers, environmentalists, performers, farmers, clergy, secretaries, physicians, scientists, engineers, retailers, skilled artisans, trades workers, and others who so magnificently contributed to society. Let us not forget that each of the individuals described in the following biographies had parents to whom some credit, at least, must be given. The sequence in which the biographies appear is that in which the subjects appear in the 1981 genealogy of the family (or, if they are not in it, the sequence in which they will appear in the second edition). It would have been foolhardy for me to attempt to present the biographies in any sequence purportedly reflecting rank of some sort. For those interested in additional information, sources have been cited. To help identify individuals, their descents from Thomas Maule are shown at the beginning of their biographies. 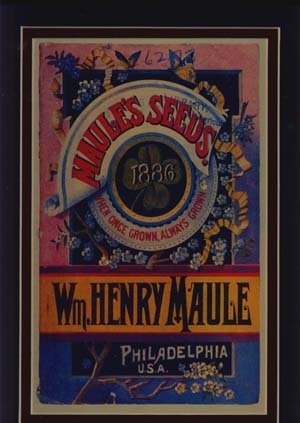 Thomas Maule was the progenitor of the largest branch of the American Maule family. He was born in Berkswell Parish, Warwickshire, England, on May 11, 1645. Around 1658, he left England, probably as a consequence of the domestic turmoil then afflicting that country. The Maules had opposed Cromwell and the Protectorate, and it is speculated that Thomas, who went first to Barbados, went there to find his father, who might have been sent there by Cromwell as a prisoner. Around 1668, Thomas went to Boston, Massachusetts, where he successfully continued the tailor and trading business he had established while in Barbados. Ten years later, he moved to Salem, Massachusetts, where he lived until he died on July 2, 1724. Had this been the full extent of Thomas' life, perhaps he would not have been so "famous". Thomas, however, became a member of the Society of Friends (Quakers), either while in Barbados or while in Boston or while in Salem, depending on which records one trusts. Some reports claim that Thomas went to Massachusetts for health reasons, which is believable considering the climate of Barbados. Others claim that Thomas went to Massachusetts as a convinced Quaker anxious to bring the teachings of George Fox to a colony dominated by those who had been allied with the alleged captor of his father. Certainly Thomas' role in the events that followed support the latter claim. Thomas engaged in many fierce controversies with the Puritans, particularly Cotton Mather and the "witch-burners" of Salem. Thomas verbally attacked the minister of Salem for allegedly preaching lies. For this, he was whipped. He was consistent in his attacks, because in one of his writings he discloses that he was imprisoned five times, whipped three times, and fined three times. In 1695, Thomas wrote, and had William Bradford, a New York printer, publish Truth held forth and maintained according to the testimony of the holy prophets Christ and his apostles recorded in the Holy Scriptures. Among the points discussed by him in the pamphlet was an allegation that God would adversely judge the prosecutors of the Salem witch trials. He did so in a style of such "cool and cutting sarcasm" that the Puritan authorities, who were very sensitive about the matter, lost all patience with Thomas Maule. The Massachusetts Bay Colony Council ordered his arrest and the Lieutenant Governor of Massachusetts issued the arrest warrant on December 12, 1695. George Curwin, the sheriff, arrested Thomas and seized 31 copies of the pamphlet. The authorities arrested Thomas because none of the printers within the Massachusetts Bay Colony jurisdiction had printed the pamphlet. Thomas Maule was brought before the Council and the Governor in Boston. He refused to answer any questions, and demanded to be tried in his own county by a jury of his peers. He was released on bail, and the grand jury brought a charge of slanderous publication and blasphemy. The trial took place at Salem, in 1696, before his Majesty's Superior Court of Judicature, Court of Assize and General Gaol Delivery, the justices present being Thomas Danforth, Elisha Cooke, and Samuel Sewall. At the trial, Thomas addressed the court and argued that with respect to religious matters the court had no power. He then addressed the jury, pointing out to it that it was bound by the King's law, no part of which Thomas had broken. He also told the jury that the presence of his name on the pamphlet as author meant nothing since it was the printer who put it there; this point had no basis in the law. The jury returned a verdict of not guilty, explaining to the court that the pamphlet was insufficient evidence of the charges against Thomas Maule because his name had been placed on it by the printer. The impact of Thomas Maule's trial cannot be understated. For the first time in a reported trial, the jury ignored the directions of the court to find a defendant guilty. The growing public impatience with secular interference with religious matters undoubtedly affected the jury, which made clear that it disclaimed any authority by the court over religious matters. The break between governmental control of secular matters and religious matters that surfaced in Thomas Maule's trial set a precedent that contributed at least in part to the First Amendment principle of separation of church and state. The result in Thomas Maule's trial was cited as authority in the John Peter Zenger case, which is regarded as the threshold decision underlying the development of the First Amendment principle of freedom of the press. Knowledge of the acquittal in Maule's trial went immediately to the three printing houses in Boston, and by mail to New York and Philadelphia. Local Boston printers stopped seeking approval for many items, and authors stopped sending controversial works out of the colony for printing. The volume of pamphlet publishing increased significantly. To printers, the Maule case meant the right to print controversial pamphlets without being subjected to penalties. After his acquittal, Thomas continued to write. In 1697, he wrote an account of his trial in New England persecutors mauled with their own weapons; giving some account of the bloody laws made at Boston against the King's subjects. In 1703, he wrote For the service of truth against George Keith; a religious pamphlet. He also wrote Letter to Cotton Mather, date unknown. Even though he continued to write, the atmosphere in New England had changed and Thomas devoted more energy to his store and to the affairs of the Salem Monthly Meeting of Friends, which put much confidence in him as an elder. He also held minor public offices, such as supervisor of roads, married twice, and raised eleven children. Joshua was born on May 15, 1806, in Radnor Township, Chester (now Delaware) County, Pennsylvania. He was a blacksmith who was living in Baltimore, Maryland, in 1827 when the schism between Orthodox and Hicksite factions split the Society of Friends. Joshua sided with the Hicksites, even though the family remained Orthodox, but after moving to Colerain, Ohio in 1832, Joshua and many others became members of the Guernseyites, who separated from the Hicksites. Shortly thereafter, Joshua led yet another faction from the Guernseyites, and the sect, though short-lived, was known as the "Maulites". John was born on May 20, 1880, in Salisbury Township, Lancaster County, Pennsylvania. He began his career as a schoolteacher, and then for twenty years he was Treasurer of the United States House of Representatives. John did not marry. He died on May 11, 1955, in Lancaster, Pennsylvania. Morris was born on March 6, 1869, in Philadelphia, Pennsylvania. He was founder and president of Leeds and Northrup, a widely known and highly respected electrical engineering firm. Morris served as a trustee of Haverford College for 43 years, as president of Haverford College from 1928 through 1945, and as president of the Philadelphia School Board from 1938 through 1948; a school in Philadelphia was named after him. Morris co-authored the text Toward Full Employment. Morris died on February 8, 1952, in Lake Wales, Florida. His children and their descendants reside throughout the eastern part of the country. Sarah was born on May 6, 1871. She was a schoolteacher. Her husband, Cornelius Weygandt, was a professor of English at the University of Pennsylvania, and author of numerous books (e.g., Irish Plays and Playwrights, A Century of the English Novel, Tuesdays at Ten, The Red Hills, The Wissahickon Hills, A Passing America, The White Hills, The Time of Tennyson, The Blue Hills, The Time of Yeats, New Hampshire Neighbors, Philadelphia Folks, The Dutch Country, Down Jersey, November Rowen, The Plenty of Pennsylvania, The Heart of New Hampshire, and On the Edge of Evening). Sarah's children and grandchildren live in the Philadelphia area. Fanny was born on December 14, 1874, in Cincinnati, Ohio. Her husband, Graham Putnam Hunt, an attorney, was a widely known bankruptcy referee, a member of the Ohio House of Representatives, and Democratic candidate for the United States Senate in 1928. Fanny died on April 17, 1968, in Cincinnati, Ohio. Her descendants reside principally in the Cincinnati area. Walter was born on October 8, 1892, in Gum Tree, Pennsylvania. He was for many years general manager of the Mushroom Growers Cooperative Association, an organization which he was instrumental in creating in 1925. He engaged in mushroom growing near West Grove, Pennsylvania, and also served as secretary and general manager of the Mushroom Cooperative Canning Company, as a director of the National Canners Association, as a trustee of the American Institute of Cooperation, and as organizing president and council member of the Pennsylvania Association of Farmer Cooperatives. Walter was an influential voice in the mushroom industry, on a national level. He secured funds for mushroom research, for developing new strains of spawn, and for finding new insect control methods. He secured duty protection for domestic mushroom growers against imported mushrooms and succeeded in having mushrooms declared an essential agricultural crop during World War II. Walter was instrumental in making southern Chester County, Pennsylvania, the "mushroom capital of the world". Edith was born on August 21, 1896, in Cincinnati, Ohio. Her husband, Anson Benoa Nixon, was chairman of the board of Hercules Powder Company, was president of Wilmington General Hospital, Wilmington, Delaware, and was a member of the board of supervisors of Kennett Township, Chester County, Pennsylvania. Edith died on June 14, 1964, in Wilmington, Delaware. B.D. was born on November 4, 1911, in Pleasant Township, Seneca County, Ohio. He is a well-known aircraft manufacturer. Maule Aircraft, in Moultrie, Georgia, specializes in short takeoff and landing aircraft. B. D. designed and flew the first successful flapping-wing aircraft, and invented a tail wheel for steering light airplanes. B.D. lives in Georgia. Claude was born on Sept. 18, 1886, in Dell Rapids, South Dakota. He was an attorney and practiced law for more than fifty years. He was one of the early pioneers in the growth of Winner, S.D., where he was widely known. During his career in Winner, Claude was city auditor, city attorney. and city treasurer for nearly fifty years, holding the post of city treasurer from 1934 until his death. He was Tripp County state's attorney from 1920 to 1924, 1934 to 1935, and 1941 to 1942. He practiced law with his son Robert for several years. Claude was chairman of the Red Cross during the disaster period in South Dakota in the 1930's. He was a member of many civic and other organizations. Claude died on May 25, 1963, in Winner, South Dakota. He married, and his descendants live in South Dakota. Marjorie was born on July 6, 1900, in Beaver Crossing, Nebraska. She was a public school teacher and Dean of Women at the University of Nebraska, where she also was a counselor. Marjorie is not married. Marjorie lives in Lincoln, Nebraska. Gilroy was born on March 11, 1905, in Philadelphia, Pennsylvania. For many years, he was the chief engraver at the United States Mint in Philadelphia, Pa. While at the Mint, he designed the Kennedy half-dollar; his initials appear on the coin below the face of Kennedy. After retiring from the Mint, Gilroy co-founded the Franklin Mint; he retired from that enterprise in the early 1970's. Emott was born on April 25, 1916. Together with his brother, Mort, he owned and operated J.E. Caldwell and Company, the renowned Philadelphia-based jewelers, a business started by his grandfather and continued by his father. Mort was born on May 28, 1918. Together with his brother, Emott, he owned and operated J.E. Caldwell and Company, the renowned Philadelphia-based jewelers, a business started by his grandfather and continued by his father. Tex was born on March 19, 1915, in Ojus, Texas. He played football at St. Mary's in Texas, was a merchant seaman during World War II, and a trapeze artist with Barnum & Bailey. He was publicity director for the Los Angeles Rams from 1949 through 1951, and a columnist with the Dallas Morning News from 1976 through 1979. Tex was a well-known author, editor, and sportswriter. He was editor for Sports Illustrated and Sport Magazine, and was featured in the 1981 Super Bowl official program. He covered professional football, boxing, horseracing, and baseball for Sports Illustrated from 1956 until 1975. Tallie was born on July 7, 1917, in Sand Springs, Oklahoma. He earned his M.B. degree at Oklahoma State University, and his M.F.A. in architecture at Princeton University in 1948, where he was a Lowell Palmer Fellow, and a diploma as a fellow of the American Academy in Rome from the Universitair Italiana in 1948. He was a Fulbright grantee to Europe in 1951. John was born on November 5, 1897, in Ogden, Pennsylvania. He played minor league baseball and pitched in the major leagues for the New York Giants (1918), St. Louis Browns (1928-1929), and Cincinnati Reds (1931-1932). He compiled an overall win-loss record of 25-34, and was elected to the International League Hall of Fame. Anna was born on October 15, 1915, in Prospect Park, Pennsylvania. She was curator of the Delaware State Museum, and is now a volunteer with the local historical society in Cape Coral, Florida. Her husband, John Jarvis McClearnen, was supervisor of historic sites for the State of Delaware. Bill was born on August 19, 1930, in Los Angeles, California. He is a retired foreign service officer with the United States Department of State. He has served as Deputy Assistant Secretary of State for Visa Services, as American Consul General in London, England, and as Consul General in Montreal, Canada. Sara was born on June 27, 1951, in Tokyo, Japan. She was the prima ballerina with the San Francisco Ballet Company. She is now in the chorus of the American Ballet Theatre. Alfred was born on August 9, 1941, in Memphis, Tennessee. He is a foreign service officer with the United States Department of State. His latest known appointment was as United States Consul and Chief Foreign Commercial Service Officer at the Unites States Consulate General in Johannesburg, South Africa. Because fifty is a nice round number and Fifty Prominent Members of the Maule Family would make a nice title, I stopped at this point. The next (and last) person on the list would be me. 1 Peleg Whitman Chandler, American Criminal Trials, vol. 1, p. 141-149 (Boston, Little Brown, 1841-1844); Edward Channing, A History of the United States, vol. 2, p. 481 (New York, Macmillan 1905-1932); James Truslow Adams, Provincial Society, 1690-1763 (A History of American Life, vol. III), p. 129 (New York, Macmillan 1927). 2 John Alexander Caldwell, History of Belmont & Jefferson Counties, Ohio, and incidentally historical collections pertaining to border warfare and the early settlement of the adjacent portion of the Ohio Valley (Wheeling, W.Va., Historical Publishing Co. 1880). 3 N.Y. Times, Sept. 3, 1913, p. 7, col. 2. 4 Charles Frederic Goss, Cincinnati, The Queen City, 1788-1912, vol. IV, p. 254-257 (Chicago & Cincinnati, S.J. Clarke Publishing Co. 1912); Lewis Alexander Leonard, Greater Cincinnati and Its People, a history, 4 vol. (New York & Chicago, Lewis Historical Publishing Co. 1927); George Derby, National Cyclopedia of American Biography, a conspectus of American biography, being an analytical summary of American history and biography, vol. 12, p. 230 (New York, J.T. White 1906). 5 The Biographical Encyclopedia of Pennsylvania of the Nineteenth Century, p. 614 (ed. Charles Robson, Philadelphia, Galaxy Publishing 1874). 6 The Biographical Encyclopedia of Pennsylvania of the Nineteenth Century, p. 614 (ed. Charles Robson, Philadelphia, Galaxy Publishing 1874). 7 Chase County Historical Sketches (Cottonwood Falls, Kansas, Chase County Historical Society 1940); Alfred Theodore Andreas, History of the State of Kansas, containing a full account of its growth from an uninhabited territory to a wealthy and important state...Also, a description of its counties, cities, towns and villages (Chicago, A. T. Andreas, 1883). 8 George Norman Highley, History of Malvern, Chester County, Pennsylvania (Downingtown, Pa., Chester Valley Press, 1964). 9 George Derby, National Cyclopedia of American Biography, a conspectus of American biography, being an analytical summary of American history and biography, vol. 12, p. 367 (New York, J. T. White, 1906); Encyclopedia Americana. 10 Smull's Legislative Directory (1885), p. 832. 11 Lancaster Intelligencer, Nov. 19, 1927, p. 1; Klein, History of Franklin & Marshall College, 1787-1948, p. 124, 215 (Lancaster 1952). 12 Davis, A Genealogical and Personal History of Bucks County. Pa.
13 N.Y. Times, Sept. 3, 1913, p. 7, col. 2. 14 N.Y. Times, Oct. 28, 1950, p. 17, col. 4. 15 George Norman Highley, History of Malvern, Chester County, Pennsylvania (Downingtown, Pa., Chester Valley Press, 1964). 16 Who's Who in America, a biographical dictionary of notable living men and women, vol. 13, p.2138 (Chicago, A. N. Marquis Co., 1924-1925). 19 Martindale-Hubbell Attorney Directory (1942). 21 Stuart News of Stuart, Fla., Oct. 10, 1957. 22 Phila. Inquirer, June 25, 1985, p. 6B. 23 Mary Anna Maule, Treasured Memories of Home (West Chester, Pa., Tinicum Press 1973). 24 Who's Who in New Jersey, v. 1, p. 354 (1939); Frederick Adams Virkus, The Handbook of American Genealogy (Inst. of American Genealogy, 1932). 25 Who's Who in America, a biographical dictionary, of notable living men and women (Chicago, A. N. Marquis Co.); New York Times, June 29, 1966, p. 47, col. 2; Who Was Who in America, a companion biographical reference work to Who's Who in America, 7 vol. (Chicago, A. N. Marquis Co., 1897-1978). 26 Who's Who in America, a biographical dictionary, of notable living men and women, vol. 22, p. 1462 (Chicago, A. N. Marquis Co. 1942-1943); New York Times, Jan. 12, 1970, p. 35, col. 3. 27 N.Y. Times, July 11, 1963. 28 "Running Scarred"; Who's Who in America, a biographical dictionary, of notable living men and women (Chicago, A. N. Marquis Co.); N.Y. Times, May 18, 1981, Sec. D, p. 13, col. 2. 29 Who Was Who in America; a companion biographical reference work to Who's Who in America, 7 vol. (Chicago, A. N. Marquis Co., 1897-1978); San Francisco Examiner, June 19, 1974, p. 39. 30 The Baseball Encyclopedia, the complete and official record of major league baseball (New York, Macmillan, 1969). 31 The Baseball Encyclopedia, the complete and official record of major league baseball (New York, Macmillan, 1969). 32 UPI, May 19, 1983. 33 Penna. Gazette, June 1985, p. 43. 34 Directory of Medical Specialists, v. 1, p. 652 (Marquis 21st ed. 1983-84). 35 TV Guide, Apr. 26, 1986, p. 20, Oct. 11, 1986, p. 27.